Here are some facts about Chepstow Castle. Chepstow Castle is in Chepstow, in the county of Monmouthshire, in South Wales. It is situated on a cliff overlooking the River Wye, close to the Welsh / English border. Chepstow Castle was built during the 11th and 12th centuries by Lord William Fitz Osbern. It is the UK’s oldest surviving stone fort built after the Roman occupation. More improvements were made to the castle at the end of the 13th century. These included the addition of a gatehouse, a back entrance and a round tower in the castle’s south east corner. The castle has four baileys, or enclosed courtyards. Although it does not have a strong keep or two sets of surrounding walls, it was still considered a strong castle. During the 15th and 16th centuries, the castle was owned by several different people, including the Earls of Worcester and Pembroke. It was used more as a stately home than as a defensive castle. Chepstow Castle was besieged twice during the English Civil War. 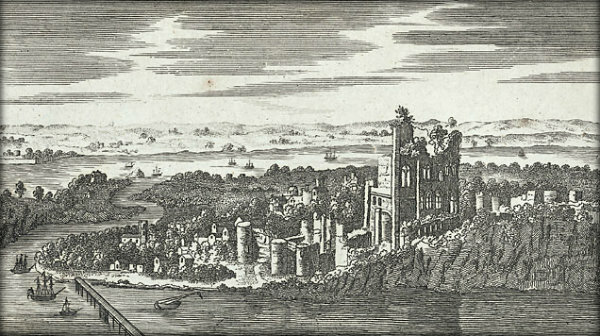 The Parliamentarian forces were able to take the castle from the Royalist forces in 1648. The castle was left abandoned from the late 17th century to the late 18th century. It became a popular attraction for tourists taking a boat trip on the River Wye. During the 1840s, the castle’s courtyard was used for farm shows and other events. The Duke of Beaufort tried to find a buyer for Chepstow Castle but was not successful. Today Chepstow Castle is open to the public and holds regular events. Some of the Dr. Who 50th anniversary broadcast was filmed there, as well as scenes from the film Jabberwocky. Across the road from the castle is the Chepstow Museum. Housed in a Georgian house, it has exhibits on Chepstow Castle, as well as the town’s salmon fishing and wine trade. What next? Visit our castles resources page for more castle facts.